Christmas came a little early in the Resolution Eats household. 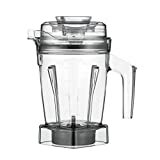 I received a new high powered blender from Vitamix to review on my blog. And I can tell you this much, it put me in a very jolly mood. I received the Vitamix E310 Explorian Series Blender. You use it for whipping, foam, emulsifying and muddling. So you can use this blender to make whipped cream or a nice foamy latte. You can use it for emulsifying in recipes like mayonnaise. And my very favorite use is for “muddling”. (I just like the word.) Muddling is when you press the ingredients of a cocktail against the side of the glass with a muddler. Muddling helps to release the flavors of the fresh ingredients so that they bind with the alcohol better. So this blender does the muddling for you. And unlike a normal blender, it leaves the ingredients intact. You can see below, that the blender released the juices and oils, but left the lemon rinds whole. The recipe I am sharing today is for a low carb cranberry lemon drop cocktail. And I have to admit, never have I so enjoyed developing a recipe. I developed the heck out of these cocktails last night. It took me a few iterations to find the right balance of cranberries, lemons, water and sugar-free sweetener. Needless to say, I did a LOT of taste testing. And here are the cranberry and lemon rind garnishes I came up with. I threaded the ingredients onto wooden skewers to give them a nice vertical effect. I went for just visual garnishes, but if you want to make the cranberries edible, then you can roll them in sugar-free sweetener. You can also rim the glass with sweetener, if you like. Now, you are going to need cranberries for this cocktail, so make sure to pick up some extra bags while they are in season around Thanksgiving. You can keep them in the freezer until you are ready to use them. But, let’s say that you missed your window and don’t have cranberries. My advice is just to add a few drops of red food coloring. The lemon flavor is so good on it’s own, that no one will be the wiser. So whether you are making it, or faking it, this cocktail is sure to be a hit. It would make a great signature holiday cocktail or a trusty old stand-by drink. Just remember to mark it as alcoholic, because it is so easy to drink, your guests might not know it’s got booze in it. Don’t be like me with my unmarked Thanksgiving cocktails. Everyone remembers when my kid took a big drink and said, “That is NOT fruit punch!”. Mom of the Year, right here. Ok, now to mix up something new with my Vitamix. Cheers! I made these low carb cranberry lemon drop cocktails with the Aer Container on my new Vitamix blender. Combine all ingredients in a Vitamix blender with an Aer Container. Turn on the blender and slowly move the dial from 1 up to 6. Blend at 6 for 90 seconds. Pour the liquid through a sieve into 3 cocktail glasses. For garnishes, you can thread a wooden skewer with cranberries or a mix of a lemon rind and cranberries. If you liked this low carb cocktail, then you might like my recipes for Raspberry Vodka, Bloody Marys or Whiskey Sours. Hi! This looks so good! I know, I missed the holidays but really, does it matter?! haha. I have a quick question… did you keep the peel on the lemons? It’s on in all your pictures so I am tempted to do it but wanted to ask. Thank you!! I did leave the rinds on. If you are using the Vitamix Aer Disk Container, then it muddles the lemons and leaves behind the rinds. If you don’t have one, then you can also muddle the cranberries and lemon slices (with the rinds on) against the side of a glass. Your photos are just gorgeous. They put me in the mood to decorate for the holidays. Can’t wait to make this beautiful cocktail to celebrate. Thanks for the inspiration. Love how perfect this is for the holiday season! Thanks! That was what I was thinking too. It’s nice to have a signature holiday cocktail. This looks awesome, and I am loving the low carb factor. I really need to watch my carb intake lately. Yumed! So cool! Did yo uuse granulated or powdered Swerve? Recipe doesn’t specify, but you mentioned powdered in the blog comments. Nice work, Emily! Hey, thanks for catching that! I actually initially used powdered, but then I tried it out with regular granular and it dissolved just as well. So I changed the recipe to regular Swerve. I will change that in the recipe to make it more clear though. Thanks again! The combination of lemon and cranberries sound awesome and refreshing. It is so easy too. Thanks. It really is easy if you have a Vitamix Aer. Lucky you to get a free Vitamix! This cocktail looks delicious, and refreshing, and so perfect for holiday entertaining!